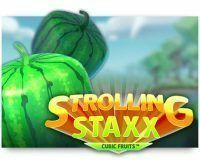 Strolling Staxx: Cubic Fruits is the second release of 2019 from Netent, after Turn Your Fortune. Netent is determined to stop the disappointing performance of previous years: the way up is what it’s all about. Unfortunately, with Strolling Staxx they can forget it. This slot is too shallow and plain for our liking: reading a dictionary is more exciting. There is only one real bonus feature and although you win it very often, almost just as often it barely rewards you anything. And then we have found some other issues. Be prepared, as this is going to be a bit of a rant. What to think of a bonus bet that yields less than NOT playing it. 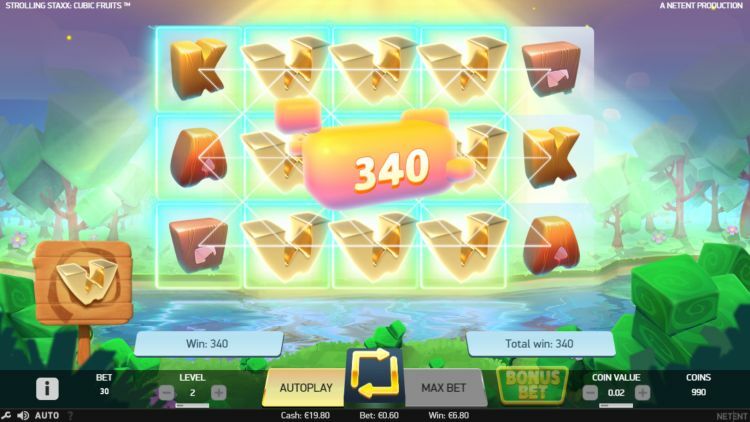 There are plenty of slots that payout more if you bet more, but a slot that pays out less if you bet more, is not something we have seen before, ever. That was until Strolling Staxx strolled along. Everything at Strolling Staxx is square: the fruit, the card symbols, the trees in the background and even the clouds in the sky. This game has a distinctive video game vibe which also channels through in the music. Strolling Staxx has 5 reels with 3 rows of symbols. You always play with 10 active paylines and without the bonus bet active, you bet a minimum of $€ 0.10 and a maximum of $€ 200 per spin. When you activate the bonus bet, you pay 50% more. The betting range then starts at $€ 0.15 and ends at $€ 300 per spin. And now for the blooper: without a bonus bet the theoretical payout rate is 95.98%. That is not overly high to start with. But with the bonus bet active, the theoretical payout ratio is suddenly 95.95%. While only slightly lower, this just does not make sense. If anything, staking more should lead to a higher return to player. What does the bonus bet do? With the bonus bet, you get an extra chance when the Strolling Staxx feature is activated. 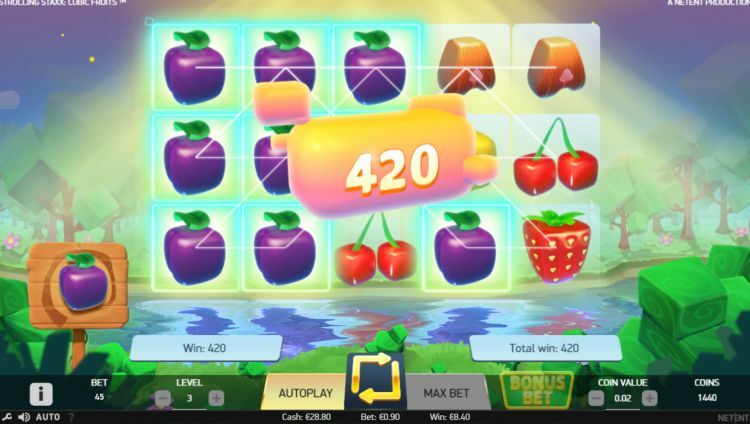 This allows extra special symbols to appear on the screen, which in turn can lead to higher payouts. The wild symbol replaces all other symbols on the reels. 5 wilds will give you a payout of 500 coins. A full screen of wilds amounts to 5,000 coins. The fruit symbols are also the most valuable, with the melon as the highest paying symbol: 500 coins for a 5-of-a-kind. The strawberry, lemon and cherry are worth a maximum of between 100 and 150 coins. There can be mega symbols on the screen of 2 x 2 or 3 x 3. 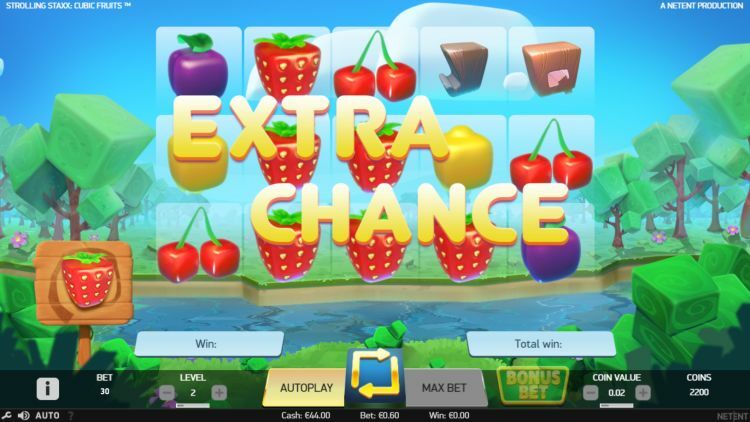 These can, of course, provide more massive payouts and thus bring the much-needed excitement and fun in the game. Every time the same symbol covers a complete reel, the Strolling Staxx feature is activated. You get a free respin while the special symbols move one spot to the left on the reels. As long as an entire stack of the symbol is visible, you will receive free respins. In the meantime, every winning combination will earn you money. Strolling Staxx is a failed Netent slot. The Strolling Staxx feature quickly gets boring and often barely wins you anything. Even a 3 x 3 wild symbol barely yielded a total win of 100 x the total bet. Furthermore, the RTP is far too low. 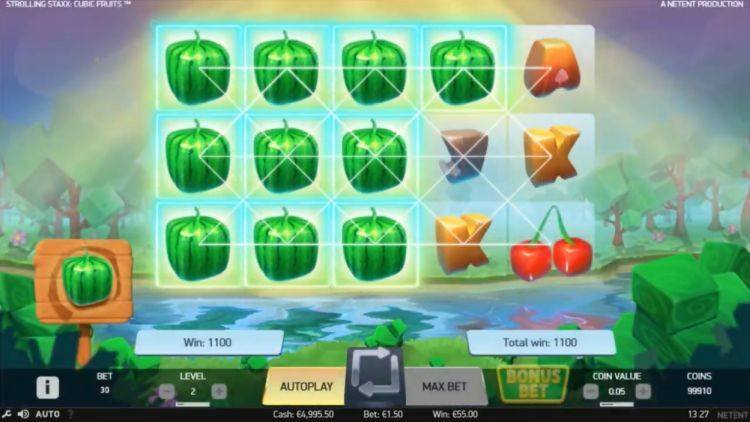 Netent slots always were known for having a high payout rate of at least 96.5% – 98%. Strolling Staxx does not even reach 96%. Where can you find Strolling Staxx? The Strolling Staxx slot is found at all reliable Netent casinos. One of these Netent casinos is Casumo, which is one of our favourite online casinos. You can play the Strolling Staxx slot at Casumo with a 200% bonus up to $€50 plus 200 free spins.